It is expected that next November 30 will be released an interesting duel between two Chinese manufacturers. On the one hand, Meizu has to introduce two new smartphones, and on the other hand, Xiaomi has planned the launch of the Mi 5c, new model of the series that already includes the Mi 5, Mi 5s and Mi 5s Plus. According to the rumors circulating in the network for days, this new device (codenamed Meri) integrates the Pinecone processor. The Xiaomi Mi 5c should have a frame of aluminum and glass (in the back), materials generally used for more expensive products. As for hardware, a 2.5D 5.5-inch display with Full HD resolution (1920 x 1080 pixels), 3 GB RAM, 64 GB flash memory, 12 megapixel rear camera with dual LED flash, front camera of 8 megapixels, WiFi 802.11ac connectivity, Bluetooth 4.1, GPS, NFC and LTE. Other interesting specifications include a fingerprint reader, an infrared sensor and a USB Type-C port. 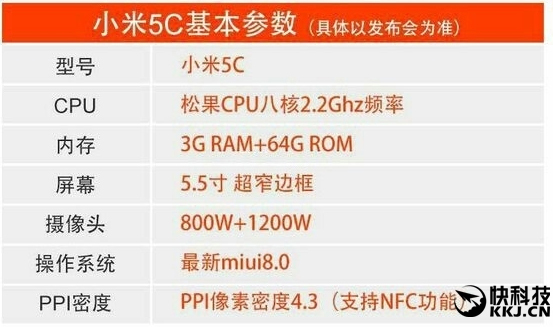 To further confirm these specifications, we have the image you can see next to this article, with a summary of the main features of this cell phone, but, as we say in the headline, our attention is focused on the fact that the embedded processor probably add more to the energy savings (with a battery that could reach up to 4,500 mAh), as we explain below. To avoid the purchase of the Qualcomm and MediaTek processors, the Chinese manufacturer has designed a SoC of the house, whose name is Pinecone. It is a chip that integrates an eight-core CPU (ARM Cortex-A53) with the maximum frequency of 2.2 GHz and a Mali-T860 MP4 GPU. Based on Geekbench's benchmark results, the Pinecone processor delivers slightly lower performance than Huawei's Kirin 650. Of course, it is in the price where the offer is higher, around $ 150, but maybe we are going too far in this direction. Better wait for the official announcement to reach conclusions. In any case, this unprecedented change in Xiaomi seems to be aimed at a mid-range market.